Every year, Steam Whistle does its part to support the Artistic Community by hosting monthly Art Shows in our Gallery, which is open to the public daily, welcoming over 25, 000 guests monthly. Submissions are open to all forms of practice; painting, drawing, illustration, printmaking, material arts, jewelry making, etc. We showcase one artist, collective, or collaborative show on the first Tuesday of every month. 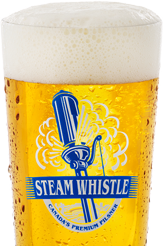 Steam Whistle provides all resources necessary for the opening night: catering sponsored by our Event Catering Partners, Bartending & Security Staff, in house AV provided by Quest Audio Visual and promotional assistance through our Public Relations department at Steam Whistle. Steam Whistle does not take any commission on the sale of your artwork. At the end of each show, we ask that each artist donate a piece from their hung show of their choosing to be donated to the brewery and hung for all future brewery guests to enjoy! The Steam Whistle Gallery is a large space, most shows require a catalogue of at least 15 medium-large pieces. For artists with smaller works and catalogues we sometimes group them together in co-shows to make the most of the opportunity. Please specify if you are interested in a solo, curated group show or both. For Solo shows, include all dimensions and estimated pieces to be brought to the Gallery. Please note: All selected artists will be required to sign our Art Show Contract and Media Release Form. Failure to do so before January 31st, 2019 will result in automatic cancellation, where your show date will be given to another artist. Steam Whistle is proud to support our artistic community, and we sincerely look forward to seeing what the 2019 Art Shows have in store!